Campbeltown, Main Street, general. View from E-S-E of Main Street including Town House. Campbeltown, Main Street, general. 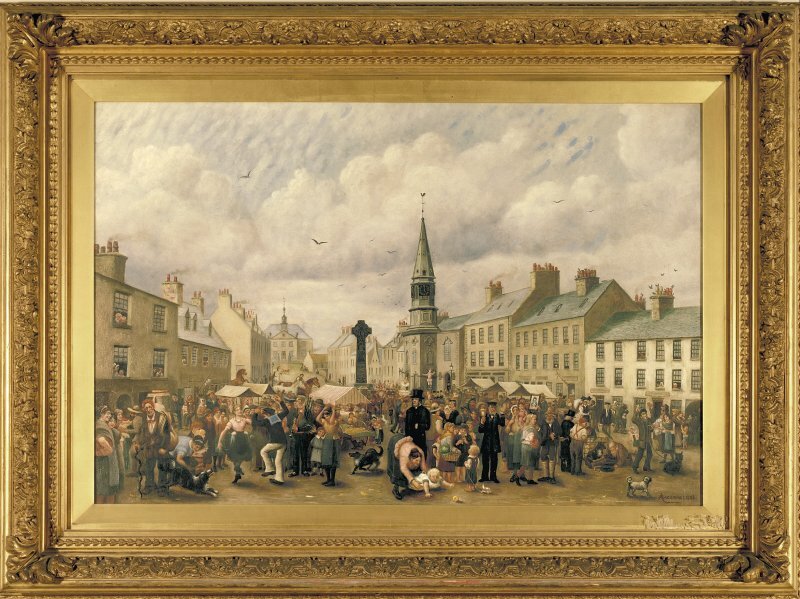 Photographic copy of a painting of Campbeltown Fair by Mackinnon, 1886. View from north east of Main Street including Town House. Campbeltown, Main Street, Town House. Steeple, detail of bell. South east elevation and strip plan. Preparatory drawing for 'Tolbooths and Town-houses', RCAHMS, 1996. 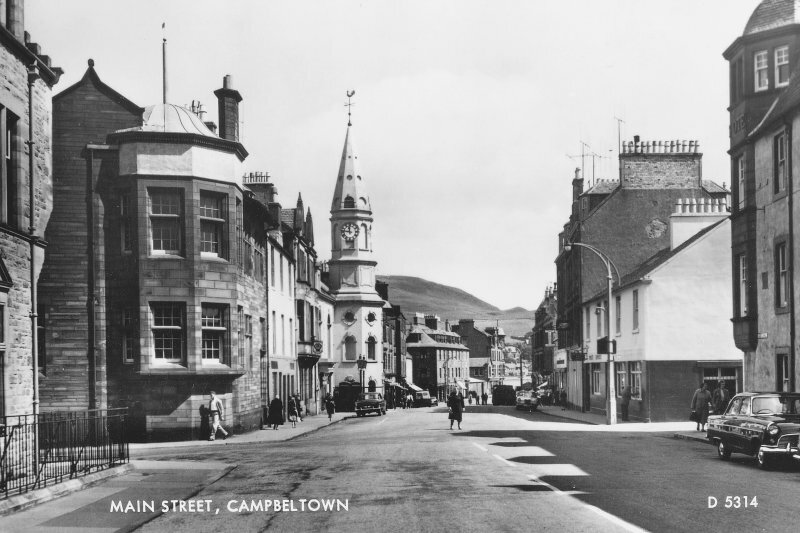 N.d.
Campbeltown, Main Street, Town House. Detail of steeple. Campbeltown, Main Street, Town House. 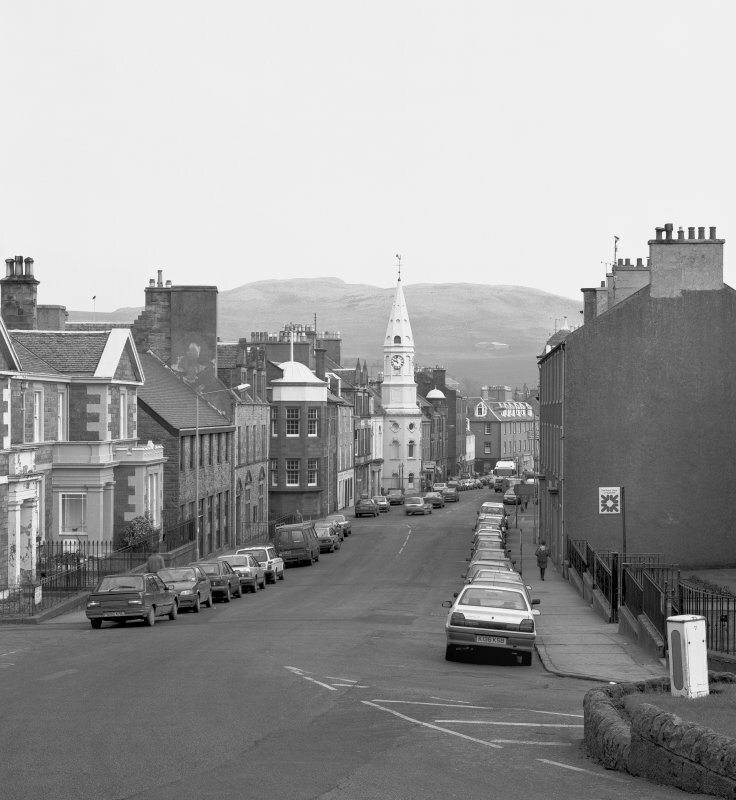 General view from S-S-W.
Campbeltown, Main Street, Town House, interior. General view from North-West of vestibule, main entrance, ground floor. Campbeltown, Main Street, Town House, interior. View from North of main hall, first floor. Campbeltown, Main Street, Town House. Front elevation. Photographic copy of a drawing in Dobie's 'Perambulations'. Campbeltown, Main Street, Town House. South entrance, view from South-East. OS (GIS) MasterMap, April 2010. 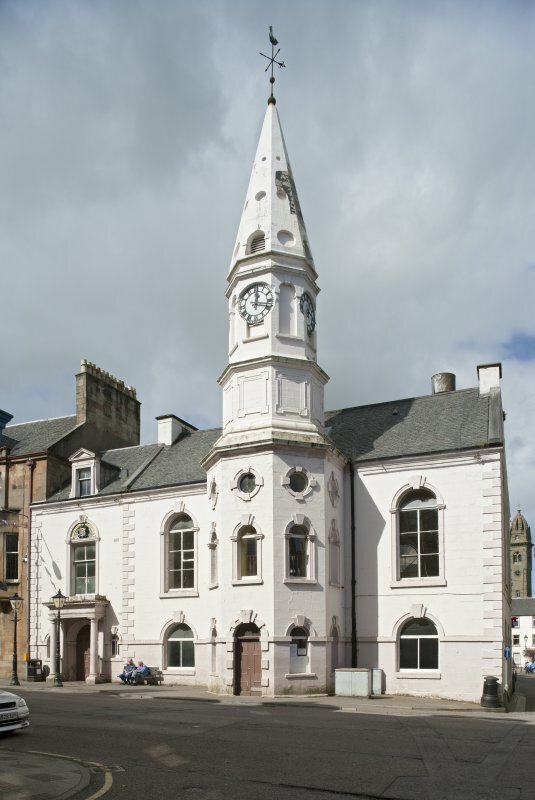 (NR 7191 2036) Town House, Campbeltown: This building was erected in 1758-60 to replace an earlier tolbooth standing on the same site. The original timber spire was replaced by the present stone structure in 1778. In 1866 the building was enlarged by the addition of a SW wing and the interior was re-modelled. The original main block is rectangular on plan, measuring 16.0m from NE to SW by 13.0m transversely over all, while the octagonal steeple projects from the SE front. The masonry is of stuccoed rubble with painted freestone dressings, and the roof is gable-ended (further architectural details given). The extension of 1866 is similar in style to the original building and contains no features of particular interest. 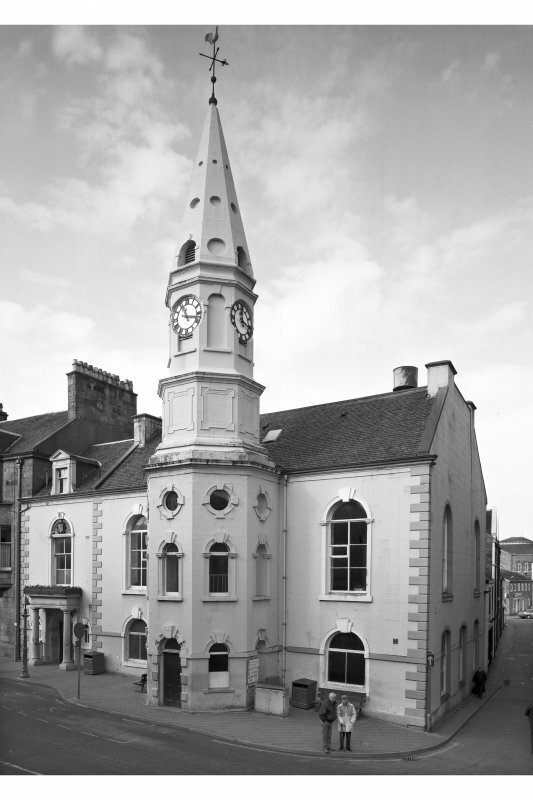 This building, which stands midway along the NW side of Main Street, was erected in 1758-60 on the site of an earlier tolbooth. 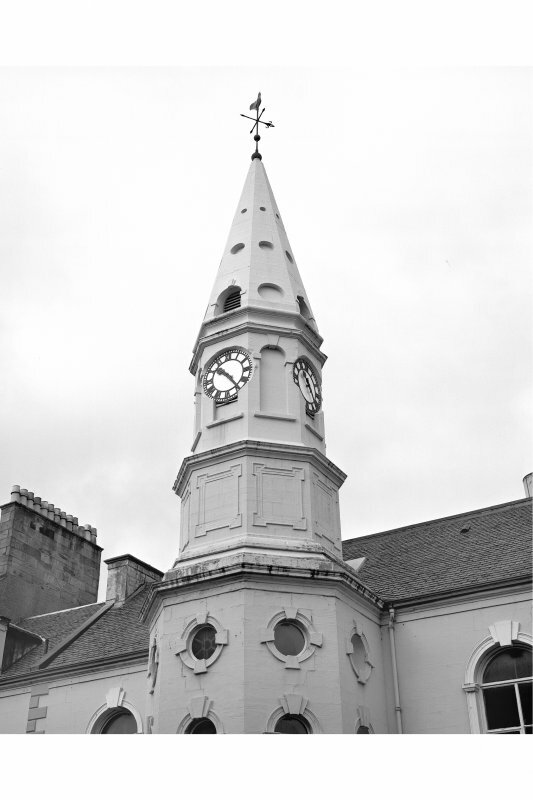 It consists of a rectangular main block fronted by a projecting octagonal steeple, a conspicuous classical landmark in the centre of Campbeltown. The all-stone upperworks of the steeple, which replaced an original timber spire, were designed and built in 1778 by John Brown, an Inveraray mason-architect. The SW bay containing the present main entrance was added in 1866, and the interior extensively remodelled, to designs by the Glasgow architect, Campbell Douglas. The original two-storeyed main block measures 16.2m from NE to SW by 13m, the length being extended to the SW by 5.6m in 1866. The steeple projects some 3.7m from the centre of the original symmetrical SE front. The masonry is of stuccoed rubble with some painted freestone dressings, and the roof is gabled and slated. The steeple incorporates three tiers of openings below wallhead level, the inner ones being of blind, alcoved form. The entrance-doorway has a Gibbs-surround, and the other openings on the two lower storeys are semicircular-headed and have moulded architraves with projecting keystones and imposts, the imposts of the ground-floor openings being extended to form a continuous string-course. The openings of the upper stage are circular and have Gibbsian architraves. Above a prominent cornice at wall-head level the steeple rises in two main stages, surmounted by a spire. The lower stage incorporates a series of square lug-moulded panels and the upper a range of blind niches, three of which contain clockfaces. The spire itself incorporates a tier of round-headed louvred openings alternating with circular recesses, and two more tiers of circles of diminishing size. The flanking bays of the main block contain round-headed windows at both levels, similar in character to the corresponding openings in the steeple. There are well-defined rusticated quoins and a moulded eaves-cornice. The general design and detail of the SW extension of 1866 harmonise with the original work. The two-leaf principal doorway is framed within a colonnaded porch of the Roman Doric order, and the tympanum of the first-floor window bears in relief the arms and motto of the burgh. The pedimented dormer above bears the date 1866. The interior survives substantially in its remodelled mid-Victorian form and possesses few features of special interest. Until the 1850s the ground storey contained criminal cells and the garret two debtors' rooms with fireplaces. 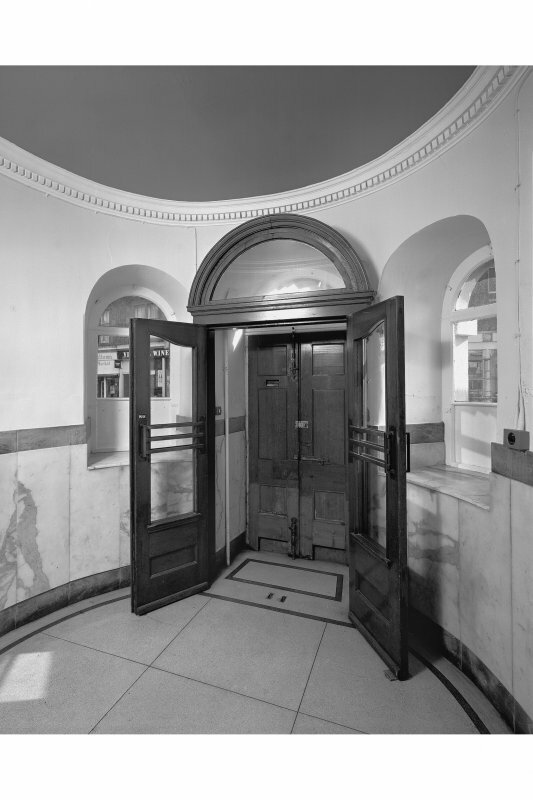 The NE half of the ground floor was later adapted as the council-chamber, which is lined with modern panelling. 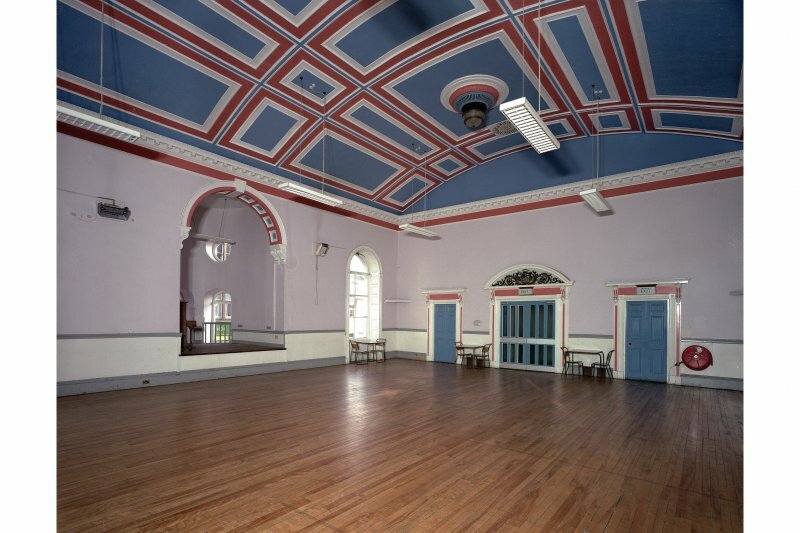 The first floor of the original block was divided into a hall in the NE half, and two rooms and a lobby to the SW. 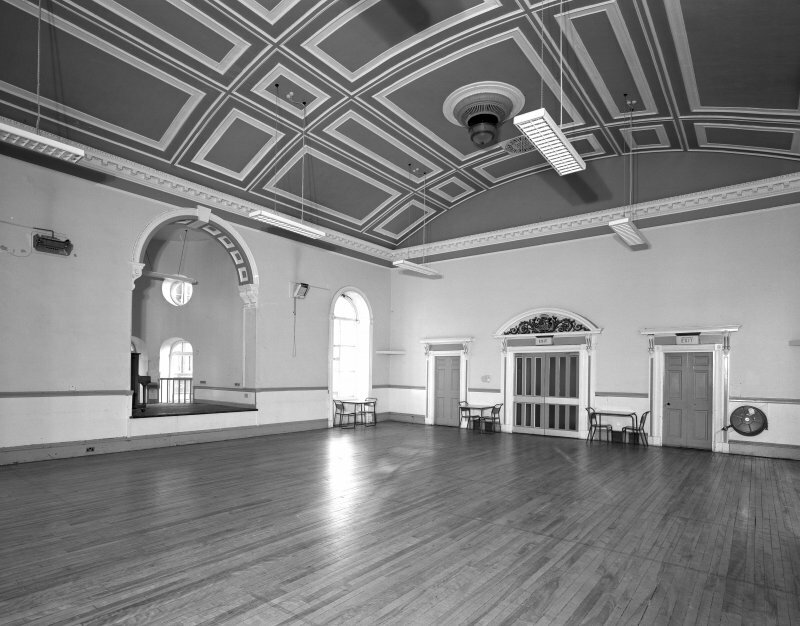 In 1866 the entire space was given over to the town hall, which is ceiled with a segmental and coffered plaster vault. It is entered through a large SW doorway with a segmental armorial pediment. This is reached by a wide scale-and-platt stair in the 1866 extension, which replaced the original newel-stair within the steeple. The steeple bell is inscribed in relief: THE TOWN OF CAMPBELTOUN: A C PRO(VOS)T: DB & R 0 BAILIES: 1779. These initials commemorate Alexander Campbell, Duncan Ballantine and Robert Orr, all of whom were elected to office in 1778. 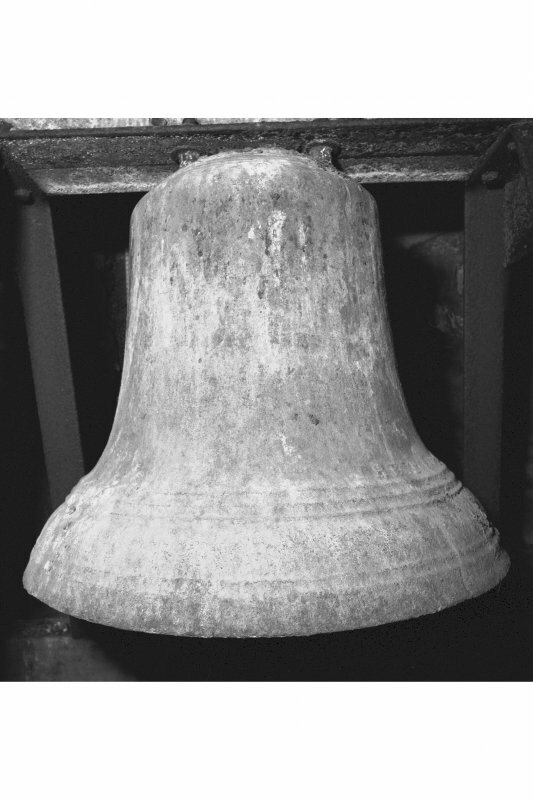 Instructions were given in 1779 to purchase a bell of suitable dimensions at Bristol, while a clock, which has been replaced, was commissioned from 'Mr Townsend' of Greenock at an estimated cost of £50. Originally known as Kilkerran or Lochhead, Campbeltown was erected into a burgh of barony for the 9th Earl of Argyll in 1667 and became a royal burgh in 1700. The old tolbooth is said to have been built' long before' 1700 and to have comprised a first-floor hall above a prison on the ground floor. By the middle of the 18th century its condition was a matter of serious concern, and in 1745 the town council accepted the 3rd Duke of Argyll's offer to build and pay for a new tolbooth, but nothing came of the scheme. They again expressed their disquiet in 1754. In 1757 the council recorded that 'the Town House or Tolbooth ... is and for a considerable time past has been in so ruinous condition that a criminal cannot be secured in it, nor any other prisoner legally confined to it'. They resolved to impose an annual tax of between £20 and £22 upon the inhabitants of the burgh (later excepting those who made voluntary contributions and to borrow up to £300 for the building of a new tolbooth. A further sum of £100, payable in three yearly instalments, was secured from the Commissioners of Supply in May 1758. By that date the old town-house and prison had been taken down, and an un-named contractor was engaged to build a new one 'according to a plan seen and approved by His Grace the Duke of Argyll'. 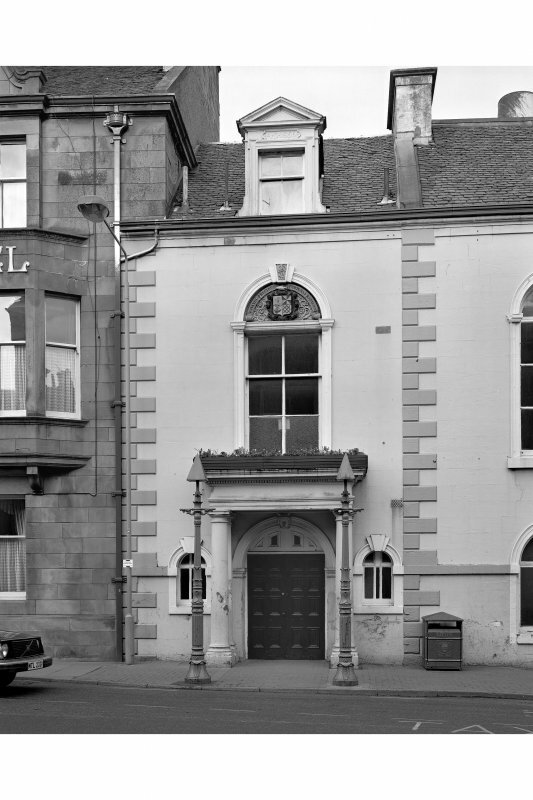 Having made a donation to the cost of a bell in the steeple and supplied furniture for the town hall, the Freemasons' Lodge of Campbeltown was in 1767 granted permission to use the hall and an adjacent room, and it was agreed that these rooms would also be made available for a proposed monthly assembly. 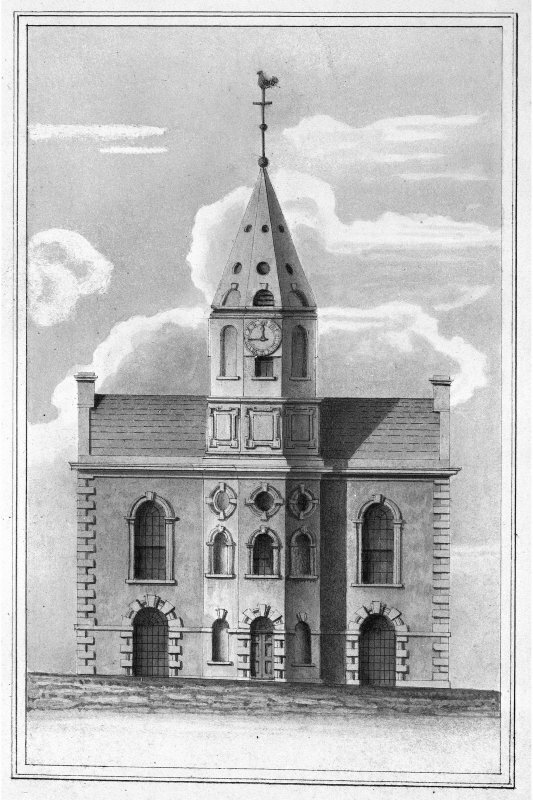 The work authorised in 1778 was for 'building a steeple on the townhouse or an addition to the present steeple in place of the timber work now standing thereon', at an estimated cost of £50 3s 6d. Some modifications to the original specification of the clock were also made in 1779, partly because the steeple was 'not so properly adapted for a clock as it ought to have been'. Sixty years later, physical conditions had again degenerated so far as prison accommodation was concerned. In 1835 the sheriff was quoted as considering it 'perhaps the worst gaol in Scotland, after the old gaol at Roth[e]say', and an official report of 1838 confirmed the prison as 'one of the worst in Scotland'. A further inspection in 1844 revealed some minor improvements, but a new prison was still 'much wanted'. A new building adjoining Castlehill Church was finally opened about 1856. A scheme for remodelling and extending the town buildings was initiated in 1865, and it was proposed that the extension to the SW would embrace a close which was part of the adjacent house occupied by the Town Officer. The principal contractors for this work were Robert Weir, builder, William Stewart, joiner, and Robert Armour, plumber and gas-fitter. The sculptor James Mossman was employed, perhaps for the armorial panel, while James Steel modelled the ornamented tympanum of the hall door and Galbraith and Winton supplied the marble mantlepieces. The architect Campbell Douglas received £170 11s 3d for drawings and 'outlay'. 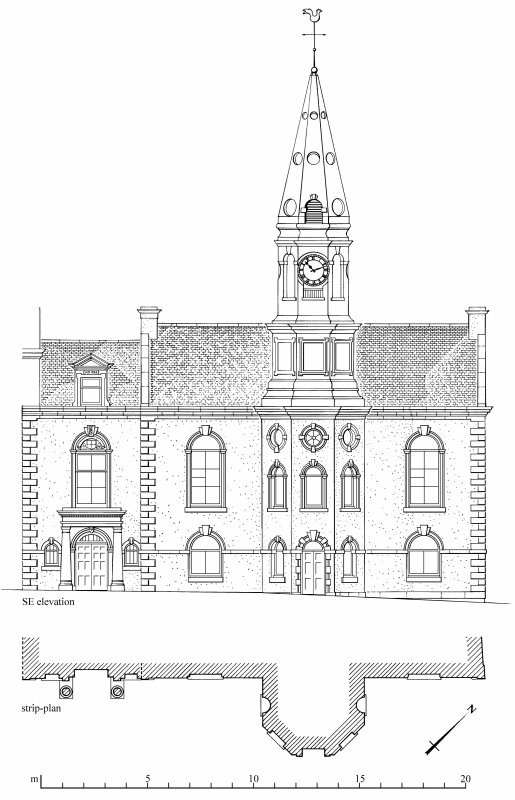 Information from ‘Tolbooths and Town-Houses: Civic Architecture in Scotland to 1833’ (1996).